Police have armed a lollypop lady with a digital camera to take snaps of cars persistently parked illegally outside a Carmarthenshire school. As well as helping pupils cross the road Linda Peach will photograph number plates of vehicles on the zig-zag lines at Burry Port Junior School. Teachers were worried bad parking could cause an accident. 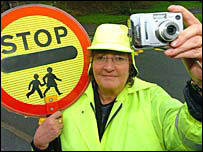 If successful other lollipop men and women at nearby schools may also be given cameras. Head teacher David Davies said the school had tried various tactics in the past to solve the issue. "It is quite a narrow road and it really does become quite dangerous when cars are parked outside," he said. "We have tried things before such as the pupils making mock speed cameras and having the police outside taking numbers. "The crossing patrol lady has been given the camera and if she feels there is a problem she can take photo and pass it on to the police." He said he believed most parents would approve of the idea if it improved the safety of their children.